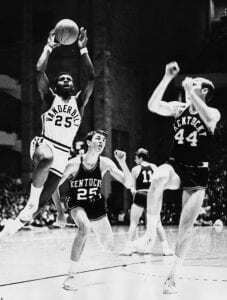 NASHVILLE, TN — Perry Wallace, BE’70, the Vanderbilt University student-athlete who integrated Southeastern Conference varsity basketball, died Dec. 1. He was 69. 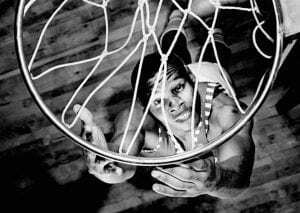 On Dec. 2, 1967, Wallace made history in a game against Southern Methodist University by becoming the SEC’s first African American basketball player to compete in a varsity game. He played in his first SEC varsity basketball game two days later against Auburn. The Vanderbilt University Alumni Association is honoring Wallace with the 2017 Distinguished Alumni Award, the highest honor bestowed to a member of the university’s alumni community and recognizes an alumnus/alumna whose accomplishments and contributions have had the broadest impact and most positive effect on humankind. A high school All-American at Nashville’s Pearl High School, Wallace led his team to a state championship on the heels of a 31-0 season as a senior in 1965-66. He was recruited nationally by more than 80 collegiate programs before choosing to attend Vanderbilt and play under head coach Roy Skinner. Along with Godfrey Dillard, a fellow African American signee from Detroit, Wallace arrived on the Commodores’ campus in the fall of 1966, becoming the first African American athletes at the university. 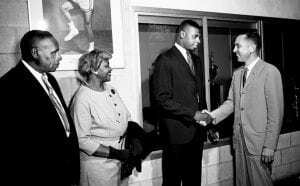 Though Wallace had been recruited by a number of basketball powerhouses around the country and was eager to leave the Jim Crow South, he later said he was struck by the fact that Skinner addressed his parents, with complete sincerity, as “Mr. and Mrs. Wallace.” It was an unheard-of courtesy in the South at the time and one that convinced Wallace to hear Skinner out. Then, on a visit to Vanderbilt’s campus, Wallace found something he’d found lacking at the other schools: high academic expectations for student-athletes. Wallace had witnessed firsthand as a boy the threats and occasional violence that erupted in response to Nashville’s lunch counter demonstrations and knew integrating the SEC would be beyond difficult, but he also knew Vanderbilt would give him the academic rigor he craved. He accepted Skinner’s offer. Though the university began admitting African Americans in 1953, there were only a few black students on campus when Wallace arrived along with his best friend from Pearl, Walter Murray. As members of Vanderbilt’s freshman basketball team, Wallace and Dillard traveled with the varsity team, playing before the main event. It was during these games that Wallace got his first taste of the rabid hostility that he would receive from Southern fans on the road. In a 2010 interview with Vanderbilt Athletics, Dillard recalled a particularly harrowing game at Mississippi State, where students met the Vanderbilt plane with protests and beat against the bus as it departed the airport. At the Holiday Inn where they would stay, the staff had roped off areas in order to keep white guests separate. Memorial Gym offered Wallace and Dillard some respite from the abuse—the crowds were kinder, and their teammates respected them—but Vanderbilt was still a lonely, often hostile place for its few black students. Black and white students didn’t socialize together, and most whites still subscribed to the “separate but equal” mentality. The following year, Wallace moved up to the varsity squad without Dillard, who had been sidelined due to a knee injury. On Dec. 2, 1967, he took the court as the first African American varsity basketball player in the SEC. He went on to play for Vanderbilt for the rest of his college career, bravely enduring racist taunts, hurled soda bottles and worse every time he took the court away from home. The NCAA even banned his signature move, the slam dunk. Despite this, he had an exemplary athletic career and ultimately became captain of the team. He was a member of the All-SEC second team and an SEC Sportsmanship Award recipient. Off the court, he was named a “Bachelor of Ugliness”—a comic honor bestowed upon the most popular man on campus by his senior class—and graduated with a bachelor of engineering in 1970. At the end of his senior year, Wallace sat down for a frank interview with The Tennessean, in which he shared the isolation and exclusion he felt during his time at Vanderbilt. The interview was highly controversial, with many in the community turning on Wallace. He was not invited back to campus for more than 20 years and had no desire to return. 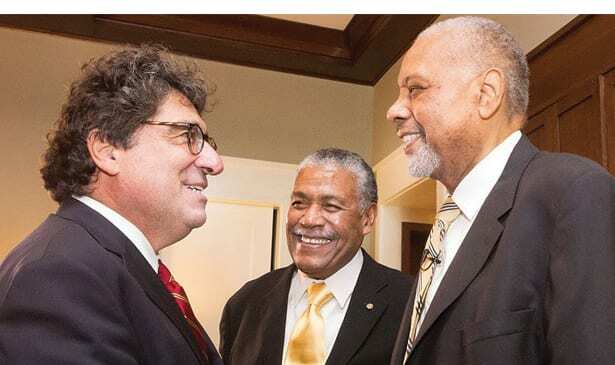 Over the past decade however, Zeppos, Williams and other university leaders worked to repair the relationship and honor Wallace’s remarkable role in Vanderbilt history and his lasting impact on its efforts today to support a diverse and welcoming community. “I am proud that I served well, helped to change Southern sports forever, and did it with truth and integrity,” Wallace said in a 2016 interview with Vanderbilt Magazine. “Vanderbilt has reached back to revive its vision and its will on the subjects of diversity and inclusion. Chancellor Zeppos’ focus is the embodiment of this idea. The issue is so difficult because it evokes deep feelings in many people that they are afraid to face: hatred, fear, ignorance about the unknown. The university is celebrating the 50th anniversary of the historic 1967 season this year with a series of events, including a documentary film, Triumph: The Untold Story of Perry Wallace. Vanderbilt provided financial support for the film, which will premiere at an invitation-only event at the university’s Langford Auditorium Dec. 4. Triumph, directed by Rich Gentile, was three years in the making and is narrated by Academy Award winner Forest Whitaker. In 2015, Wallace’s Vanderbilt classmates created the Perry E. Wallace Jr. Scholarship in his honor. The need-based scholarship is designated for deserving undergraduate students at the School of Engineering. He was inducted into the School of Engineering’s Academy of Distinguished Alumni in 2016. In 2007, Wallace delivered the inaugural Murray lecture, named for his best friend and classmate Walter Murray. Wallace delivered the lecture as part of the dedication of Murray House, a residence hall at The Martha Rivers Ingram Commons. On Dec. 1-2, Wallace was honored by the Southeastern Conference with the prestigious Michael L. Slive Distinguished Service Award at the SEC Football Championship in Atlanta, Georgia, along with Vanderbilt University teammate Godfrey Dillard and the four Kentucky football players who integrated SEC football: Nate Northington, Wilbur Hackett, Houston Hogg and the late Greg Page. Vanderbilt observed moments of silence to honor Wallace before the women’s basketball game Dec. 2 and the men’s game Dec. 3 in Memorial Gym, where Wallace’s nephew James, who had represented him at the SEC Championship earlier in the weekend, and Dillard were in attendance. In addition, commemorative posters marking the 50th anniversary of the integration of the SEC were handed out to fans. In 2016, Vanderbilt Athletics honored Wallace and other Civil Rights-era pioneers during the university’s inaugural Equality Weekend. He was inducted as an inaugural member of the Vanderbilt Athletics Hall of Fame in 2008 and the Tennessee Sports Hall of Fame in 2003. His jersey was retired by Vanderbilt in 2004, and he has been named an SEC Living Legend and to the Silver Anniversary All-America team by the National Association of Basketball Coaches. Wallace is survived by his wife, Karen, his daughter, Gabrielle, and a host of extended family members. Learn more about Perry Wallace’s life and his legacy of courage at vu.edu/courage.